The theme auto detects the default Google AdSense and the custom banners which respect the structure provided in the documentation and makes them responsive automatically. Each ad spot has one box where you can insert your ad code. To manage the Article Top Ad go to Newspaper > Theme Panel > Ads and open the Article Top Ad section. Paste your ad code and save the settings, if you use Google AdSense the theme will automatically make it work on all devices (responsive). The Article Top Ad will be added automatically to each post before the article content begins. 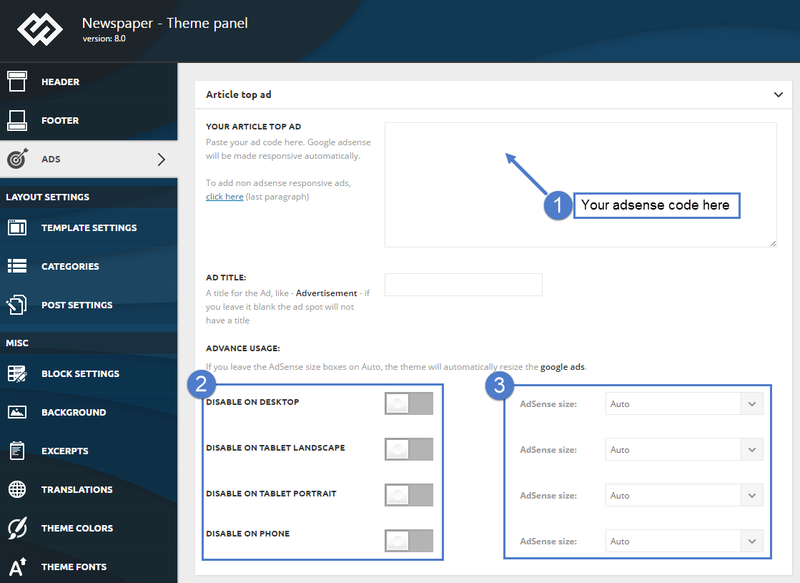 To set up your ad go to Newspaper > Theme Panel > Ads and open the Article Top Ad section. 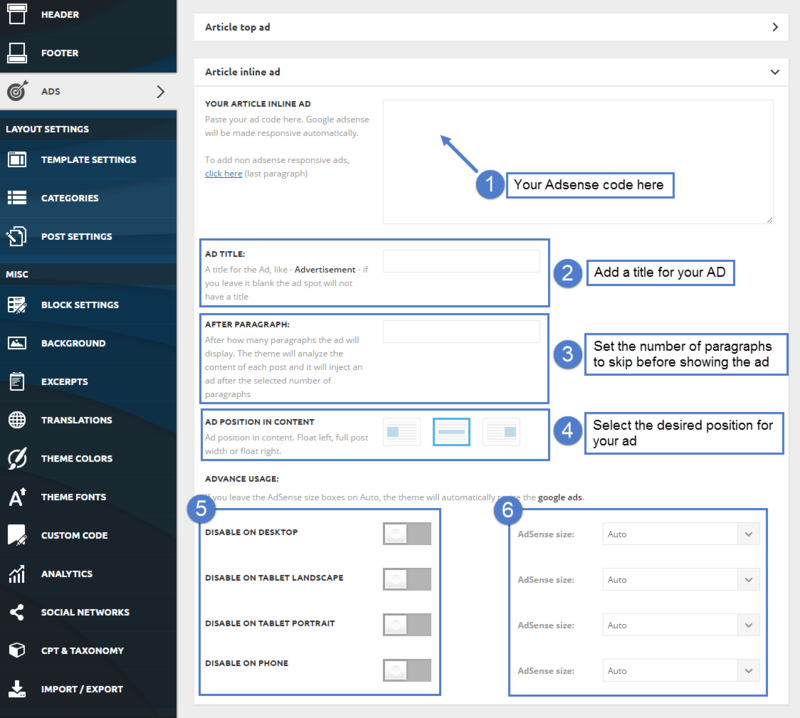 Step 1 – Add your AdSense code to the required area. Step 2 – Choose if you want to deactivate your AdSense on different devices. Step 3 – Specify the size of AdSense for different devices or leave it to Auto and the theme will automatically resize the AdSense. After you finished customizing your Article Top Ad click on the Save Setting button. The theme auto detects the default Google AdSense and the custom banners which respect the structure provided in the documentation and makes them responsive automatically. Each ad spot has one box where you can insert your ad code. Please read below how to set up the Article Inline Ad. To manage the Article Inline Ad go to Newspaper > Theme Panel > Ads and open the Article Inline Ad section. Paste your ad code and save the settings, if you use Google Adsense the theme will automatically make it work on all devices (responsive). 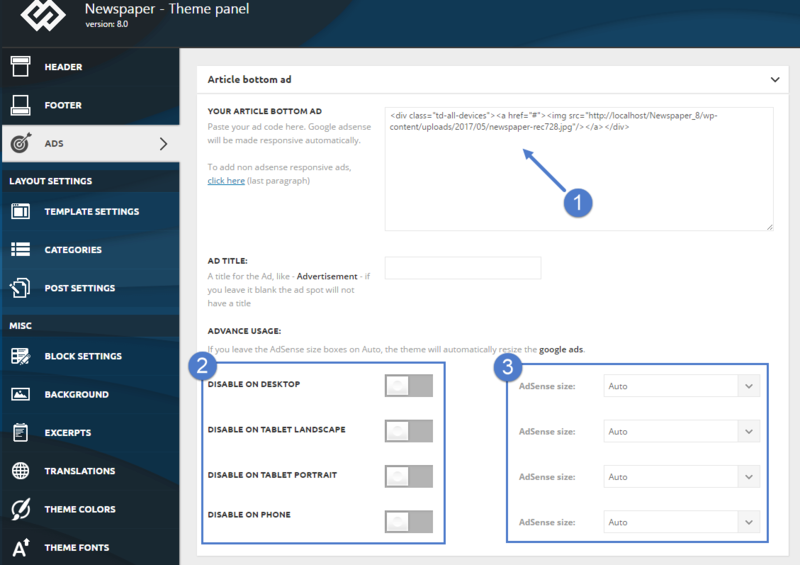 The Article Inline Ad will be added automatically after the paragraph number that you have specified. To set up your ad go to Newspaper > Theme Panel > Ads and open the Article Inline Ad section. Step 3 – Specify after how many paragraphs the add will be displayed. on the left/right side with content besides. Step 5 – Choose if you want to deactivate your AdSense on different devices. Step 6 – Specify the size of AdSense for different devices or leave it to Auto and the theme will automatically resize the AdSense. After you finished customizing your Article Inline Ad click on the Save Setting button. The theme auto detects the default Google AdSense and the custom banners which respect the structure provided in the documentation and makes them responsive automatically. Each ad spot has one box where you can insert your ad code. Please read below how to set up the Article Bottom ad. To manage the Article Bottom Ad go to Newspaper > Theme Panel > Ads and open the Article Bottom Ad section. Paste your ad code and save the settings, if you use Google Adsense the theme will automatically make it work on all devices (responsive). The Article Bottom Ad will be added automatically to each post after the article content. To set up your ad go to Newspaper > Theme Panel > Ads and open the Article Bottom Ad section. After you finished customizing your Article Bottom Ad click on the Save Setting button. If you want to use custom sizes, check the official list. The theme automatically sizes the ads to best fit the available space but if you want to use custom sizes you can easily set one for each device. Google AdSense – If you enter a Google AdSense code, the theme will make it responsive and the ad will fill the available space. [shortcodes] – the spot will run do_shortcode() on the ad. Using shortcodes you can add adRotate ads to that spot.